Joyce did not use the automatic garage door opener in baby owl season. A small screech owl was once again nesting in the box that John had, years ago, attached under the canopy of the oak tree at the far side of the garage. It was prodigious real estate for owls; a mere fifteen feet from miles of state forest but also overlooking the strip of yard along the driveway; a good spot from which to begin an evening’s hunt. 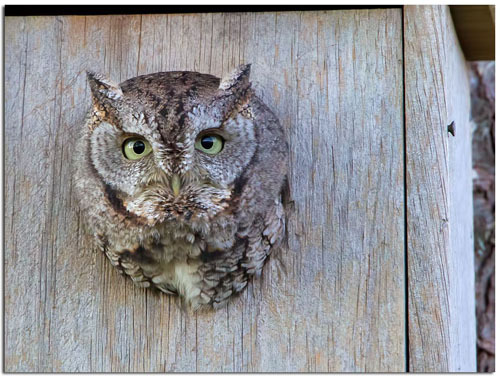 Screech owls are very cute, very small, very shy … and they freak at the hum and rattle of an automatic garage door mechanism. So every late winter to early spring Joyce would let herself into the garage via its side door. Then she opened the garage door by hand, which somehow didn’t send the owl scolding and flying. She would back the car out, climb back out of the driver’s seat, close and lock the door, and drive off. She reversed the process when she came home. She knew this was slightly ridiculous; the little owl could easily move into the forest. But Joyce loved the small wild creature that was her closest neighbor. .
Today Joyce was on an almost all-day mission. She was driving from her home in the woods, up to the expressway and then into Milwaukee. Her friend Malva lived on the west side of the city and Joyce was going to drive her to her chemo appointment. It would be a long day but Malva’s son lived out east and her daughter was taking several weeks to visit her own family in California. Joyce was glad to say yes when Malva asked if she could help. She and Malva been friends nearly fifty years; it was the least she could do. Joyce could just visualize a bulky white guy with broken blood vessels in his nose, probably chomping down donuts fetched by an unpaid intern in a tight shirt and a loose understanding of history. Joyce flipped her finger at the radio. What world was he talking about? Joyce shrugged. “Simple… I was engaged to Ron that year. I mentioned the comment to him and he went absolutely nuts ridiculing the opinion of a high school girl he’d never met! I thought he was a little over the top about it; but didn’t see it for the red flag it was. Malva leaned back again. A look of pain crossed her face. “Joyce, I need help doing something I have been thinking about, well, every day of my life. I lobbied Louisa to go to California to visit her kids and grandchildren because I thought you were the best person to help me. I don’t want to take this to my kids, not yet. Malva took a deep breath. “I’m 83 years old and I have cancer and I will probably not live another year. I hope I do, but it is doubtful. So I need to deal with this now, if I can, to make my peace with my life. “My first year at college. The man was a handsome professor. His name was Roy and he was as charming as he was despicable. He surveyed his classes, picked out a shy girl who was also somewhat attractive – that autumn it was me – and easily seduced his prey. Malva’s eyes were staring at nothing. The look of grief on her face nearly broke Joyce’s heart. Joyce heard the background murmur of others talking, of the medical pumps, of the quiet blather of television. She and Malva had been friends all these years; yet Joyce had never heard this or even imagined it. They had talked about theater and music and the weather, not about themselves. Even though they had never even hugged each other in all the years they’d known each other, Joyce reached out and took Malva’s hand. Both of the women giggled a little. With that pronouncement, tears began to spill from Malva’s eyes. She sighed deeply, wiping her eyes with the back of her free hand. Joyce handed her tissues. “I thought I couldn’t take on any more. Also, I was so afraid she would just show up in my life and Marshall and the kids would find out about her, and then my miserable house of cards would fall down. Joyce turned Malva’s frail hand over, smoothing her fingers over Malva’s. Malva blew her nose and went on. “But now I have cancer and I would like, if it is possible, to close this story with whatever decency is left in me. “This is what I would like. I would like to communicate to my daughter that I am so sorry I turned her away. I would like to let her know me as little or as much as she would like. I want to apologize to her. I want her to know the flawed, weak woman that I am. I don’t expect anything from her; I just want to make whatever I have left available to her. If she wants to know Louisa and Phil, I will tell them. Joyce realized by the end of the next day that all Malva needed was a go-between. Finding her daughter was not complicated; Monica Hall was registered to be found. They made arrangements by email to meet on a Saturday afternoon in the municipal park of a town midway between them. Malva was quiet in the car; twisting her handkerchief into knots. Joyce smiled to herself. Malva was of her generation; still carrying a hankie. Joyce reached her hand to cover Malva’s. No one would understand except for the women who had lived through it how much women’s lives had changed during the years when they were young. Malva grew up in a world where women wore gloves and carried hankies and were virgins when they married. Joyce, not even twenty years younger, stopped wearing gloves before high school - and started using birth control in college. That fast, girls’ and women’s’ lives had turned inside out and upside down. Joyce and Malva shuffled slowly across the village square lawn. Joyce felt Malva’s hand trembling against her arm; her other hand clutched the cane she had begun to use as the cancer sapped her strength. The woman at the picnic table stood up and walked towards them until she stood in front of Malva, smiling as Malva returned her look of wonder, tears running down her face. The women reached out at the same time to grasp each other’s’ hands. Joyce stepped just a little to the side to watch. Both women were of medium height and body shape, though Malva was shrinking with age and illness. Both had clear hazel eyes, fine eyebrows and, as they gazed at each other, beautifully warm smiles. She realized that both women looked like older Barbara Eden’s; all they needed was “I Dream of Jeannie” harem pants. As young women with pretty faces and smooth blonde hair, they must have been so appealing to men. Both wore dark pants, perfectly matching dark shells, and a brightly colored cardigan. Malva’s was dark pink; Monica’s was white with green leaves. Both had jackets prudently folded over their arms in case the sunny May afternoon became chilly. The women ambled to the picnic table under a tree. Joyce helped Malva situate herself on the end of a bench and then sat next to her. Malva looked into her daughter’s face, blinking at tears, lifting her frail hands to try to wipe them away. This friend, who was the very personification of dignified composure, was quite simply melting. Joyce put her arm around her. The women sat several minutes, waiting for Malva to catch her breath and find her voice. After that there was so much to say. Joyce edged a few inches further away from the two women. She listened and watched as Malva and Monica looked at, talked to, and drank each other in. Monica spoke about herself clearly and efficiently. “I loved my family and they loved me. There was never any question about that. But I still felt, especially as I grew up, that I didn’t quite fit.” She made air quotes in the air. “My family was nuts for sports. We watched games on television. We went to all the school football and basketball games. My three brothers were all on teams – did you know they adopted me because they wanted to have a daughter but kept having sons? “But as I matured I realized I didn’t love sports as much as my family did. I didn’t hate them, I just wasn’t as coordinated as my brothers, and I’d eventually get bored playing on teams. I liked reading and making up stories and doing things in the kitchen with my mom. “My family was active in a Methodist church. In high school during a service one Sunday I was so bored I picked up one of the pew Bibles and started to read Psalms -- and discovered an ancient poetry about people who didn’t feel at home in their world. Weirdly, Psalms made more sense to me about being adopted than anything else I was aware of. That feeling of not being at home, even when you are. That feeling of not quite belonging. “This would eventually lead to college and then, somewhat unusual for a woman back then, to seminary. I became a United Methodist pastor which I still am. I eventually realized that feeling as if I didn’t quite belong – that that is how many people feel. I just probably felt it a little more and little earlier than others. Being adopted led me to my adulthood. The afternoon spun on. Respect, curiosity, affection, and relief bloomed between the two women. Joyce excused herself to look for a coffee shop. Malva and Monica barely looked up as she walked away. The truth was that she was on the edge of a panic attack. It had been years since she had felt this way; her heart hammering and sweat breaking across her shoulders. She reminded herself to take deep breaths; deep calming breaths. Just keep walking; keep breathing. She found a diner where she sat in a corner booth to order a cup of tea. Her soft, old woman’s body felt as if it was one of the long-ago, thick, hand-me-down winter coats from her sister. Her mom would button her in so that she could hardly breathe. The collar would be tight and itchy, the wool weighed heavily on her child’s shoulders. She couldn’t run or breathe, she would start to panic and then her mother would scold her for whining as she and her siblings were rushed out the door to the school bus. She could never figure out how to be a good girl and a happy child at the same time. There always seemed to be something heavy buttoned down over her, holding her down, holding her back. She suddenly remembered the awful radio deejay and his harangue about women and how they ought to look and act. How he had ranted that women ought to go back to this, Joyce realized, to a time when a mother and a baby who had done nothing wrong, lost each other. The child taken from her mother’s arms. The mother who would never recover from that loss, not in 65 years. Lives had been built to fill in the holes left when they were taken from each other; but the realities of separation marked them forever. Most people would say they had done fine, maybe better than most. But Joyce felt her heart turn over. There was endurance here. There were lives lived with generosity, intelligence, and grace. But this loss. The loss of all the women of her generation who had not figured out how to be brave until they were years past the moments where they had been so deeply wounded. That claustrophobic feeling of being a child in a girl’s body. The dreadful illusions that they moved forward into; assaultive husbands, demeaning families, numbing jobs. Endless rounds of work and chores, care-taking and obligations. That heavy, itching coat of expectations that hung so heavily on their shoulders. Loss and duty. Endurance. Endless self-deprecating kindness towards others. Selective memory and the unexamined belief that things will get better soon, if she can just hang on a little longer. Joyce drank her tea, her hands shaking at the bleakness. Some spilled on the Formica table surface, she wiped it with a paper napkin, her action the unthinking response of a woman of her age when she makes a small mess. Clean it up right away. Don’t leave even a puddle of herself behind. She purchased plastic-wrapped cookies on the way out of the restaurant, then carried the sack slowly through the village streets. Seeing, as if for the first time, the cost of the beauty and order all around her. Gardens filled with tulips and daffodils, prettily painted houses with neat trim. The tinkling laughs of children playing outside a church daycare center supervised by smiling young women with a dark ponytail. A middle-aged woman pumping gas into a clean car at the filling station. Placards in store windows for church dinners and rummage sales, a recycling program and a book club welcoming new members. The door of a storefront library opened as a child walked in, she saw two women working at the front desk. She walked past a Real Estate company owned by a husband and wife, she wondered who sat down first each evening at the end of their days. How much of everything around her was created by women who were curtailed, constrained, and careful? Women who were living kind and helpful lives on top of deep streams of grief and loss? She crossed the street again to the town square; making her way to the picnic table where Malva and Monica still held hands. They were laughing. Malva’s face shone, breathtakingly happy in the love she had found. Monica, it was so clear to Joyce, was both daughter and pastor in this moment. Longing for this mother’s love; careful with the soul of this aging woman. Joyce breathed in a deep breath and then walked to them with the cookies, all she had to give to these two women who had lost so much. It was nearly dark by the time Joyce turned into her driveway; the tiny new leaves of spring did not quite block all of the setting sun. She opened the car door and got out to stand a moment to let her stiff knees realign themselves for walking. She folded her arms along the top of the car to admire the amber hues of dusk turn tree trunks and the garage gold. The moment was quiet and beautiful, and then she heard the small tremolo of the owl. It was staring at her from the opening of the box, its pale eyes watched her, blinked, and then called its soft vibrating purr again. Joyce felt the intense feelings of the day gather behind her eyes and spill over her cheeks. The longer she lived, the less she knew of what to do with suffering and loss and running out of time just when one finally found the mounds and piles of love that had always been there. The owl thrummed as she pulled the key from her pocket and walked around to the side of the garage to unlock the door. A very moving story, beautifully written, and a wonderful reminder of how the world has changed so much and still not enough. I really appreciate your comment. Makes me more confident to keep writing. #MeToo has sent many of us spinning back into our early lives. Thank you so much. This is such a rough time to live with our 'Full-hearted, Bring It ON, We have imagination and we have room' American ideals and gusto. All the interesting people I know are wrestling - alone and in groups and congregations with others - about how to BE Big-Hearted in this mean time. It is not just a political reality - it is a spiritual fight. I appreciate how we support each other. Your story touched my heart and caused me to wander through many dark corners of my memories of those times. Your story reminds of to be vigilant least we return to those times. Thank you for writing and sharing. I had to stop reading twice to collect myself: the emotion in this story hit home so fully and elegantly. What a discovery to find your website. Thank you. Thank you for telling me. It was written out of both anger and wonder at the places we women have been and where we are now.